Nifty Fifty Holiday Offer! – AmeriColor Corp. The holiday season is here, and we want to show our appreciation to all of you for making 2017 a fantastic year. So, when you order a Soft Gel Paste™ Nifty Fifty Kit by December 19th, you will receive a Christmas Gourmet Writer™ pen set, plus four of our newest Soft Gel Paste™ colors—Laurel, Sangria, Cork and Blush! Blush is the first of our Soft Gel Paste™ colors to be dual purpose. It can be added to buttercream and royal icing in the usual manner for a no-fade light pink. It can also be painted with a brush onto the surface of your choice to achieve a Rose Gold color with a metallic finish! 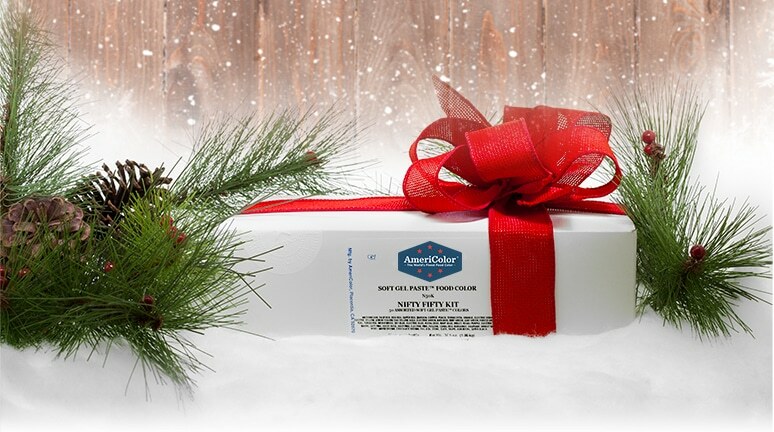 There is no alcohol in this product and it is kosher certified, like all AmeriColor products.Click HERE to view our Nifty Fifty Kit. Thanks for a fantastic year and happy holidays to everyone!